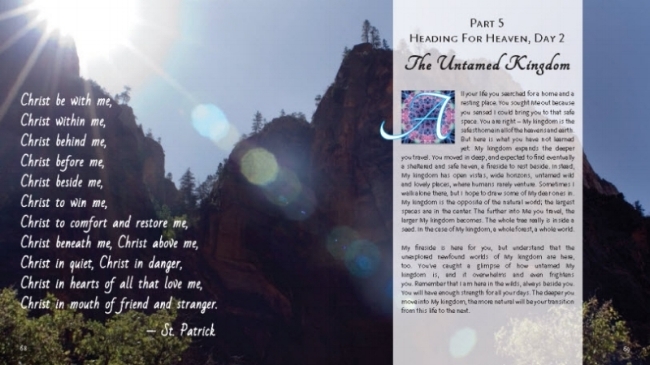 Order your copy of Messages from God: An Illuminated Devotional here! All orders are fulfilled through Vervante Publishers. Messages from God is a full color five-week devotional which uses words and images to draw the reader closer to God. The text is written in the voice of Jesus, much like Sarah Young’s beloved devotional Jesus Calling. Each week is a step on a journey that begins with the concerns of managing day-to-day life, and ends with a transcendent vision of heaven. Organized into five sections - Daily Life, Experiencing God, Living in a Broken World, God Transforms Us, and Heading for Heaven - Messages from God ministers through both language and visual art, and includes quotations drawn from a variety of Christians, from the ancient to the modern world. Inspired by the illuminated manuscripts of the medieval church, this 21st century work seeks to connect readers to a timeless God.